If it is your first encounter with Turkish culture, the richness of the Turkish breakfast table may leave you in awe. Lost for words, even. 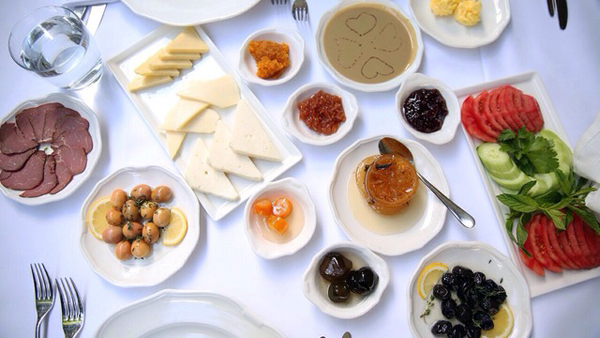 Though there are variations from region to region, generally a Turkish breakfast table consists of bread, butter, cheese, tomatoes, cucumbers, olives, honey, jam, eggs, pastrami, and tea – but Turkish specialities such as kaymak, menemen, börek, and simit are the additions you will not find anywhere else. Here is a handy dictionary of the most important breakfast foods, so that you can navigate your way around the breakfast tables of Turkey with ease. Börek is a dish made with yufka, a dough much like phyllo pastry. Inside the layers of yufka you’ll find a display of Turkish creativity: from minced meat to eggplant, cheese to potatoes, börek comes with various fillings each designed to give you a different experience. Börek is available at most bakeries as well as many breakfast places. Because it’s made hot and fresh every morning, it’s an excellent choice on weekdays. Simit (called gevrek in some parts of Turkey) is a circular bread with a hole in the center, covered with sesame seeds. You can buy simit at bakeries across Turkey, as well as from street sellers in the mornings. Some simit is sweeter than othes, and goes well with a morning coffee. There is nothing more decadent than a bite of bal kaymak (honey and cream). Kaymak is clotted cream, scraped off the top of fresh milk and refrigerated. Because nothing here is ever done half-heartedly, Turks spread kaymak on a slice of bread – and on top of that, a layer of honey. A traditional Turkish breakfast does not include coffee – typically, Turks drink tea with the morning meal. Kahvaltı (the word for breakfast in Turkish) is actually a combination of two words: kahve (coffee) and altı (before, in this context) and so it literally means before coffee. Onions, tomatoes, and green peppers fried in olive oil are the first ingredients of a classic menemen. Into this mix, the chef cracks an egg or two and whisks them all together. 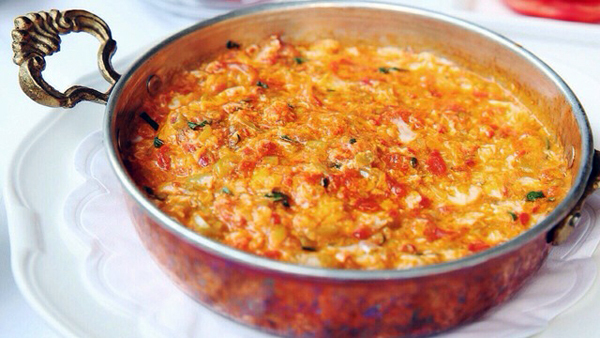 Seasoned with black pepper and other spices such as kekik (thyme) depending on the region and the chef, menemen is served immediately in the pan in which it’s cooked. This is the one local speciality on this list that’s actually very easy to make at home. This entry was posted in Food & Drink, Turkey and tagged turkish breakfast by yalla2013. Bookmark the permalink.